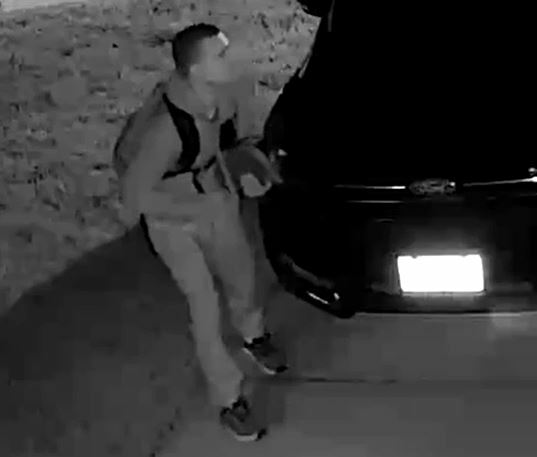 On April 11, 2019, at about 9:00 am, Deputies with the Montgomery County Sheriff’s Office were dispatched to the 9900 block of Cassowary Drive in Conroe in reference to a vehicle burglary. The victim told Deputies that sometime in the previous night, an unknown person stole several items from the vehicles in their driveway. Included in the stolen items was a loaded pistol. Due to there being no signs of forced entry to the vehicles, it is believed that the vehicles were not secured at the time the crime occurred. During the course of the investigation, it was learned that someone also attempted to break into the next door neighbor’s vehicles as well. This incident was captured on security cameras. In the video, the suspect appears to be a white male with a shaved haircut, wearing light-colored clothing and a backpack. A separate burglary of a motor vehicle occurred on near-by Western Ridge Way and may have been committed by the same individual. This incident also involved a pistol being stolen from an unsecured vehicle. Through long-running campaigns such as the #9PMroutine and TLC (Take your keys, Lock your Car, Conceal your things), the Montgomery County Sheriff’s Office urges residents to remove all valuables, and lock your vehicles at night. Anyone with information regarding the identity of the person pictured below or these incidents is asked to contact the Montgomery County Sheriff’s Office 936-760-5800, or the Montgomery County Crime Stoppers at 1-800-392-STOP and refer to case numbers# 19A117905 or 19A117823.